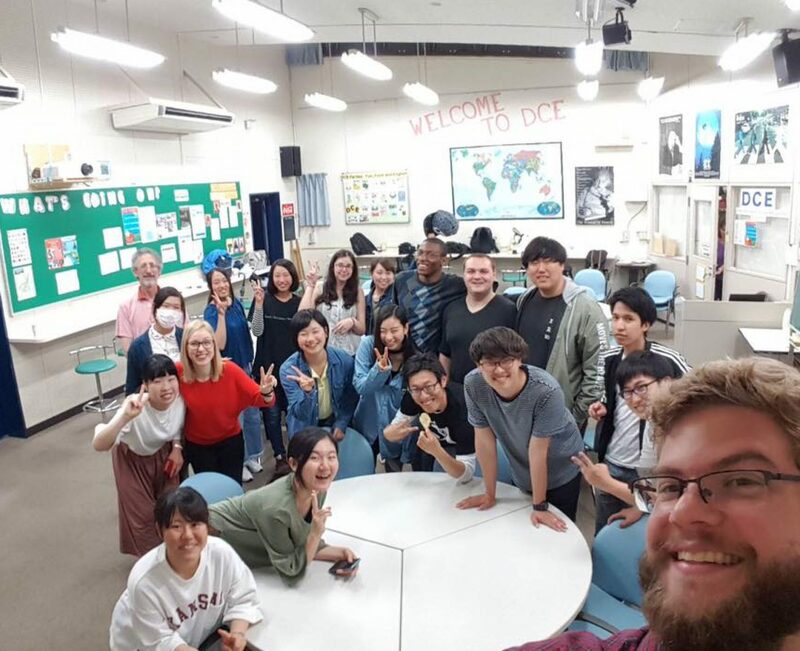 Hello, my name is Uria Thomas and I interned at Ibaraki Christian University in the fall of 2018. I knew when I came to Japan I wanted to find some good hiking spots, especially because I was interning during the fall. I am from Texas, so there are not many good hiking spots. If you want to hike in Texas you have to travel FAR, and good luck finding fall leaves to look at. Needless to say I wanted to find a good spot in Japan to hike and see the fall leaves, it wasn’t hard at all to find a place near by! If you come to Japan during the fall I highly recommend traveling to some sort of hiking location! The leaves in the fall make for some beautiful scenery! Even if you’re not someone who really enjoys hikes, there are places you can go that require very little walking. I went to Hananuki Keikoku in Takahagi, which is about a 20 minute train ride to from Omika, and a 15 minute bus ride from the Takahagi station. There are a few different hiking trails once you get off the bus. One trail leads to a beautiful waterfall, and it’s around a 2 minute walk from where you are dropped off. 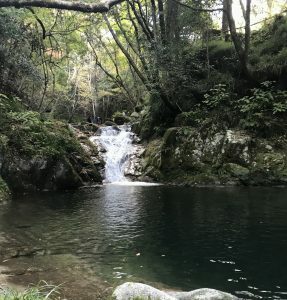 I think the waterfall is one of the most beautiful locations on the hike, so if you’re not much of a hiker this will allow you to enjoy a nice view, take some pictures, and grab some local food at some of the food stands. If you are taking the bus be aware that the last bus to the train will leave shortly after 2:00 PM! So, going earlier is better, so that you will have enough time to see everything you want to. I arrived at Hananuki Keiko at about 11:00 AM and got the bus back just after 2:00 PM. So, I had three hours to hike and explore. DO NOT MISS THE BUS BACK TO THE STATION! Once you exit the bus there will be a sign that tells you when the last bus will depart. So, make sure you definitely keep an eye out for that. I went during the fall and it was beautiful! 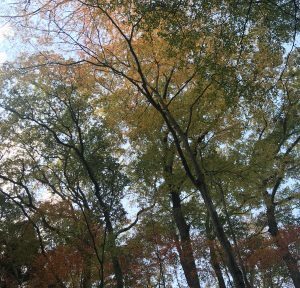 The leaves were changing colors, so I was constantly surrounded by beauty. Some of the most beautiful and worthwhile spots are the hardest to get to. I unknowingly went up a rather difficult trail, and it took me about 50 minutes to make it to the top of the trail head. However, it was the most amazing view. I have shared some photos below. The waterfall picture (above) is the closest to the drop off location. It’s probably one of the prettiest spots, but I do recommend hiking a little further to some of the other locations as well. Ultimately, Hananuki Keiko is great for someone who doesn’t want to do much hiking, or for someone a bit more experienced. Either way, you will be able to see some beautiful leaves and scenery. 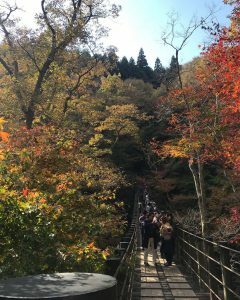 The bridge is the most popular spot at Hananuki Keiko. To walk to the bridge it takes around 7 or 8 minutes, and it’s a bit uphill. There is also a beautiful stream and waterfall below the bridge as well. It was very packed when I went, because I decided to go on a Sunday. It might be less crowded if you chose to go during a weekday, but I am not sure. If you decide to go across the bridge and walk a little further there is a bathroom and picnic spot, as well as the second parking lot. Just after the restrooms is another trail on the left side. This is the trail that I went up. It is a very difficult hike, uphill the majority of the way, but at the top is a beautiful view of the mountains!